It's been over three months since Josh had the opportunity to review the Note 4 in its details. The defining characteristic of that review is that it was a look at the variant with Qualcomm's Snapdragon 805 SoC running at the heart of the device. This version is found in devices shipping in North America, Western Europe, China and Japan. While these markets have now been served by Qualcomm's silicon offerings, Samsung is now back on track at trying to expand its market-share of in-house Exynos SoCs. As such, all other markets (with small exceptions) seem to be getting served Exynos variants of the Note 4. While we normally try to cover all aspects of device performance, for this review we will focus on the SoC and the differences that result from this change. Before we continue on, we'd like to thank international phone specialist 28Mobile.com for providing us with an Exynos unit of the Galaxy Note 4. Camera 16MP Rear Facing w/ OIS, 1/2.6"
(S.LSI S5K6D1) 16MP Rear Facing w/ OIS, 1/2.6"
The model breakdown of the Note 4 is quite a mess. The S805 version breaks down into about 9 different local versions, each with different RF frequency support and varying modem configurations. The Exynos variants are even more convoluted in terms of modem choice. We've been reporting that we might see Intel's XMM7260 as the predominant modem in Samsung's SoCs, but that seems to have changed and the Intel modem is only shipped in a small percentage of total units on the SM-N910U model, which ships in South-East Asia. In their home country of Korea Samsung continues to rely on their own modem, recently marketed as the "Exynos Modem" series. Samsung has been steadily developing their own modem hardware over the years and it seems the M303 is at feature parity with the Intel XMM7260 and Qualcomm's MDM9x35. This year Samsung has been pushing their modems outside of Korea in several devices such as the Galaxy S5 Mini, so I expect them in the future to be more prevalent in other global markets. The surprise supplier and big winner of this generation is Ericsson; the M7450 is found in unarguably the largest portion of Exynos variants, the SM-910C and SM-910H, shipping throughout South America, Central and Eastern Europe, Africa, the Middle East, and some Asian countries. Brian first reported on this modem over 1.5 years ago and we haven't heard much about it since. The surprise here is that Ericsson managed to get such a big design win before announcing that they will discontinue development on modems altogether. The even more intriguing story is that the M7450 is used in the 3G version of the Note 4, usually a traditional Intel design win. Whatever model you end up with, and as long as the frequency bands match your provider, the choice between Snapdragon and Exynos remains the biggest differentiation. Everything else from camera to WiFi to battery size remains the same in an identical form-factor. For this review we're investigating the SM-910C running on firmware KTU84P.N910CXXU1ANJ8. 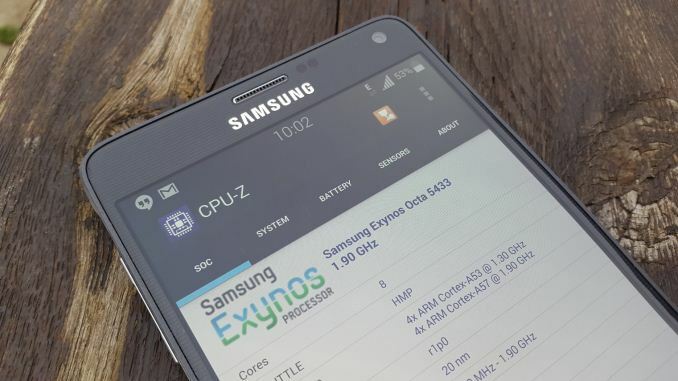 I had reported back in September that Samsung's new Exynos 5433 found in the Note 4 is actually the first implementation of ARM's A53/A57 and T760 new SoC IP. While it took Samsung some time to actually officially announce the part, they eventually did confirm it. The interesting disclosure here is that they choose to market it in the Exynos 7 family, which certainly makes more sense than keeping it in the Exynos 5 category of SoCs. Also in my initial article I shared my opinion that I doubted that Samsung would update the Note 4 to AArch64 - this was based on the fact that the kernel treats the SoC as an A7/A15 part and most of the software stack remained 32-bit. Events since then seem to point out that they will eventually upgrade it to 64-bit, since we're seeing official patches in upstream Linux with the chip being introduced with a full ARMv8 device tree. This is interesting to see and might point out that Samsung will go the effort to upgrade the BSPs to AArch64; however it remains unclear whether we'll see this on the Note 4. My personal opinion remains that we won't be seeing this overhaul in Samsung's 5.0 Lollipop update. I've been able to confirm that the GPU on the 5433 is an MP6 configuration, meaning it sports the same amount of cores as the previous Mali T628 implementations in the 5430, 5422 and 5420. I've also acquired a Galaxy Alpha which I'll review at a later date, but noticed that Samsung is also shipping 825MHz memory on that device. As such, the bandwidth of the 5430 is corrected from the publicized 17GB/s down to 13.2GB/s. Samsung has retained the cache sizes found in the older 54xx SoCs, meaning 512KB on the little cluster* We see a reduction to 256K on the L2 of the A53 cluster, and a continuation of 2MB on the big cluster. I would have liked to see the A53's getting 1MB of L2 but it seems we'll have to wait for future SoCs to see an improvement there. In other regards, the 5433 differs very little from the 5430. It has almost identical auxiliary block IP, sharing the same ISP, hardware decoders and encoders, various interfaces, and a similar bus architecture. With the modem and SoC platform being the two main differences between the two Samsung devices, there are some other minor changes of components. On the audio side Qualcomm's WCD9330 is replaced by WolfsonMicro's WM5110 audio SoC. The Wolfson IC uses its integrated DSPs for voice processing, replacing the need for an additional Audience eS705 audio processing chip that is used in the Snapdragon variant. This might result in different call and audio quality between the two versions. The WM5110 also takes over device voice activation duties for the Exynos Note 4, which you can use with SVoice or Google Now. I also noticed that yet again Samsung did not allow for native 44.1KHz audio playback in the default configuration of Android's AudioFlinger on the Exynos version, causing forced resampling of 44.1KHz content to 48KHz. Neither version allows for higher quality output, even though both audio solutions support 24-bit 192KHz audio in hardware. I'm not sure what Samsung's audio team is doing here but it's getting increasingly frustrating to see this issue continue, starting with the Galaxy S4. In terms of media playback, Samsung has not exposed the HEVC/H265 hardware decoder of the Exynos 543X's to the media codec capabilities list of the system. The device is still shipping with the decoder block's firmware, so again this is either an oversight or something has gone wrong during development of the device. The Qualcomm version exposes the HEVC decoder of the Snapdragon 805. A large functional difference between recent Exynos SoCs and Qualcomm variants comes with the capability of the display controller. 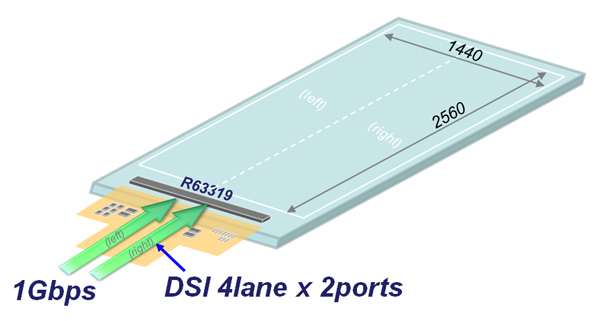 Due to 1440*2560*32bpp*60fps picture bandwidth exceeding the transport capacity of a 4-lane MIPI DSI link from the SoC's display controller to the display driver, Qualcomm devices need to double up on this interface and use dual-DSI links. The Qualcomm S805 uses two DSI ports with 4 lanes each to drive the display in halves of 720x2560 pixels, while the Exynos SoCs since the 5420 are able to make do with just a single 4-lane port with help of Mobile Image Compression. MIC compresses the data stream and thus avoids this bandwidth bottleneck. The disadvantage here is that the display driver itself must be able to decompress the stream. With Samsung developing their own AMOLED display drivers they can however take advantage of this vertical integration and implement this in their phones and tablets. The power advantages here can vary up to 150mW if the image stream is able to be highly compressed, or about 100mW on average. This of course has the biggest impact on highly dynamic content, as static content power consumption has mostly been resolved by Panel Self Refresh, which has seen wide adoption over the last 18 months.